Surah Muhammad - The Praised One: Exegesis of 47th Chapter of the Holy Quran ~ Islam My Ultimate Decision . Sūrat Muḥammad is the forty seventh surah with 38 ayahs with four rukus, part of the 26th Juzʼ of the Holy Qur'an. 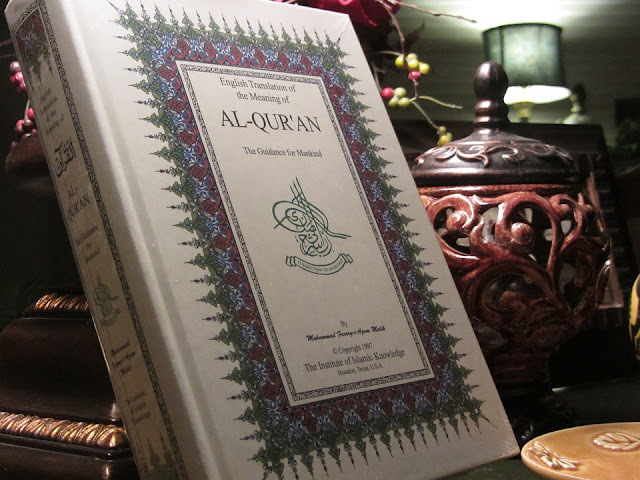 When examining the current arrangement of the subject matter of the Surahs / chapters of the Holy Qur'an, independent of chronology, a logical thread is observed that runs through them. Here is group of three Sürahs (47-49), which deals with the organization of the Muslim Ummah or community both for external defence and in internal relations. The present Surah deals with the necessity of defence against external foes by courage and strenuous fighting.and dates from about the first year of the Hijra, when the Muslims were under threat of extinction by invasion from Makkah. This sura pertains to a specific conflict that arose from people prohibiting the acceptance and spread of Islam. And has a strong focus on the first battle of this Ummah - the battle of Badr. So the language will be strong in tone. And is almost an entire explanation of the last ayah of the previous surah; Ahqaf (46) - a Makkan surah. It may be added for information and interest that Surah Anfal (8) is also a commentary on the battle of Badr, while Surah at-Tawba is a commentary on the last of battles in the seerah (Fat-h Makkah and Tabuk). Surah Muhammad is a introduction to the first victory - Badr. And then the next Surah al-Fat-h (49) is the next victory of al Hudaybiah. Note: The explanation / exegesis of some of the verses is rather long for the reason that this was the first Surah which had been revealed just before the fighting of Battle of Badr commenced. Thus there were many important commandments that were given to the Muslims when facing the disbelievers who had evicted them from their houses in Makkah and had now come to fight them with a view to obliterating the very foundations of Islam and killing the very small community of Muslims so that Islam is finished away once for all. In this Surah, the first nineteen ayahs speak of aggressive hostility to Faith and Truth and that it should be contested firmly, for Allah helps those who fight in His cause. The words adalla aamala-hum (led their deeds astray, let them go to waste) are very comprehensive in meaning. Their one meaning is: Allah deprived them of the grace that their efforts and their labors should be spent in the right way. Their second meaning is: The works that they have been performing as pious deeds, e.g. guardianship of the Ka'bah, entertaining the guests, treating the kindred well and such other works, which are counted among religious services and noble actions morally, were rendered fruitless by Allah. The third meaning is Allah rendered fruitless and vain the efforts they were making to obstruct the way of the truth and to keep their creed of disbelief alive in Arabia as against the Prophet Muhammad (peace be upon him). All their designs and endeavors now are aimless, they will never attain their goals by these designs. "Did He not put their efforts into Waste? [present-future tense implies Continuity]. 2. But those who believe and do righteous good deeds, and believe in that which is sent down to Muhammad, for it is the truth from their Lord. Surah aal Imran (3:144) - وَمَامُحَمَّدٌ إِلَّا رَسُولٌ قَدْ خَلَتْ مِن قَبْلِهِ الرُّسُلُ - wa maa muhammad il-laa rasool qad khalat min qablihi ar-Rusul - and Muhammad is except a Messenger, many Messengers passed away before him..
Surah al Ahzab (33:40) مَّا كَانَ مُحَمَّدٌ أَبَا أَحَدٍ مِّن رِّجَالِكُمْ وَلَٰكِن رَّسُولَ اللَّهِ وَخَاتَمَ النَّبِيِّينَ - Muhammad is not the father of your men but he is the Messenger of Allah and the seal of the Prophets)..
Surah al Fat-h (48:29) مُّحَمَّدٌ رَّسُولُ اللَّهِ - Muhammadun Rasool Allah... - Muhammad is the Messenger of Allah. 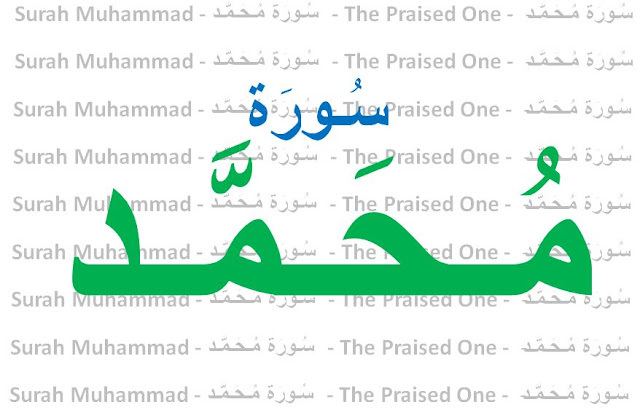 In Surah al-Saff 61:6 - the name "Ahmad" is mentioned by prophet Jesus. [Jesus gave the good news of Prophet Muhammad] bringing good tidings of a messenger to come after me, whose name is "Ahmad." Besides by name, Prophet Muhammad (peace be upon him) is addressed as; Ya ayyuhan-Nabi/Rasool (O Prophet/Messenger) in other parts of the Qur'an, Among the five places in the Qur'an where Muhammad or Ahmad is mentioned, the word 'Rasool' (Messenger) is mentioned near to it. However, the only exception is Surah Muhammad itself where there is no mention of 'Rasool'/Messenger. Now the obvious question that comes to the mind is that what could be the wisdom behind 'Rasool' not being mentioned next to Muhammad (peace be upon him)? 1 - People who knew the truthfulness and seriousness of Islam - so they submitted to it whole-heartedly. 2 - Hypocrites who only became Muslims so they do not feel as outcasts in society. When fighting was ordered by Prophet Muhammad (peace be upon him), the groups 2 and 3 were shocked. They found out that they had to fight the strong elite of the Arabs - the Quraysh, who were known for their bravery and strength in war. Thus these two groups wanted an excuse so that they would not have to fight. They could not show they were cowards or that they were hypocritical, so they came up with a response. And their obvious question was, "Why do we have to fight when it has not been stated in the Qur'an (that we have to fight)? Allah wanted to show these people that what Prophet Muhammad says in matters of religion is equal to what Allah says, since after all - he is Allah's Messenger. "وَيُرِيدُونَ أَن يُفَرِّقُوا بَيْنَ اللَّهِ وَرُسُلِهِ- they desire to differentiate between Allah and His Messenger [in regard to rulings] (Nisa'4:150)" So Allah is telling us and them that what Muhammad (peace be upon him) says is part of the religion of Allah, and that what he says is a command from Allah. Even if that command is not in the Qur'an. So Allah purposely does not mention Muhammad 'Rasool Allah' (Muhammad the Messenger of Allah). Because even by not mentioning 'Rasool Allah' - you still have to obey him in full-submission. Since that is what you agreed to by becoming Muslim. The main point is: You should not differentiate between what Prophet Muhammad commands, and what Allah commands in the Qur'an. They are from the same source. To cause separation between Allah and His Messenger / the Qur'an and the Sunnah is the trait of the hypocrites. 4. So when you meet those who disbelieve [in battle], strike [their] necks until, when you have inflicted slaughter upon them, then secure their bonds, and either [confer] favor afterwards or ransom [them] until the war lays down its burdens. That [is the command]. And if Allah had willed, He could have taken vengeance upon them [Himself], but [He ordered armed struggle] to test some of you by means of others. And those who are killed in the cause of Allah - never will He waste their deeds. It does not behoove a Prophet to have captives until he has crushed down the enemies in the land. You desire the gains of this world, but Allah desires the Hereafter, and Allah is All-Powerful, All-Wise. Had not a decree already been issued by Allah, you would have incurred a severe chastisement in consequence of what you have done. So eat of what you have taken as spoils because it is lawful and pure. The meaning of "If Allah had so willed, He would have Himself exacted retribution from them. (But He did not do so) that He may test some of you by means of others" is that if Allah had only wanted to crush the worshipers of falsehood, He did not stand in need of your help for this. He could have done this through an earthquake or a tempest in no time, But what He wills is that the followers of the truth among the people should enter into a conflict with the worshipers of falsehood and fight against them so that the qualities and characteristics of each are brought out clearly by means of the test and each is given the place and rank that he deserves according to his conduct. "As for those who are slain in the way of Allah, He shall never let their works go to waste." means: A person’s being slain in the way of Allah does not mean that he lost his life and as far as his person was concerned, all his lifework was wasted. It is wrong to think that the sacrifices of the martyrs are not beneficial for themselves but only for those who live after them in the world, and take advantage of their sacrifices. The fact is that even for the martyrs themselves it is a bargain of profit, not of loss at all. The real aim of the Muslim army in war is to break the fighting power of the enemy until it is crushed and the war lays down its arms. Under no circumstances, should the Muslim’s lose sight of this aim and start taking the enemy soldiers as captives. Captives should be taken after the enemy has been completely crushed and its numbers thinned down. The Arabs have been so instructed at the outset lest in the greed for ransom and taking slaves they should forget and overlook the real aim of the war. You have the option whether you show them favor or accept ransom from them. This gives the general law that the prisoners of war should not be put to death. A man can be killed only during the war. When the war is over and one has been made a prisoner, it is not lawful to kill him. Since in this verse it has neither been clearly forbidden to kill the prisoner, the Prophet (peace be upon him) understood this intention of Allah’s command, and also acted accordingly, that if there was a special reason for which the ruler of an Islamic government regarded it as necessary to kill a particular prisoner (or prisoners), he could do so. This is not the general law, but an exception to it, which would be applied only when necessary. Thus, the Prophet (peace be upon him) put to death only Uqbah bin Abi Muait and Nadr bin al-Harith from among the 70 prisoners taken at Badr, and only the poet Abu Azzah from the prisoners taken at Uhud. In this connection, the jurists of Islam have also made three other points: (a) That if a prisoner accepts Islam, he cannot be killed; (b) that the prisoner can be killed only as long as he is in the government’s custody; if he has been allotted to, or given in somebody else’s possession by sale, he cannot be killed; and (c) that if the prisoner has to be killed, he should be killed in a straightforward way; he should not be tortured to death. The general command that has been given about the prisoners of war is: Show them favor, or accept ransom from them. Favor includes four things: (a) That they should be treated well as prisoners; (b) that instead of killing them or keeping them in captivity for lifetime, they should be handed over to the individual Muslims as slaves; (c) that they should be put under jizyah and made dhimmis; and (d) that they should be set free without ransom. As for the prisoners of war in custody of the government’s custody, the government will be responsible for his food and clothing, and his treatment if he is ill or wounded. Islamic law does not permit prisoners to be kept without food or clothing, or be subjected to torture. The Prophet (peace be upon him) distributed the prisoners of Badr in the houses of different companions and gave the instruction: Teat these prisoners well. One of those prisoners, Abu Aziz, has reported: The Ansar Muslims, in whose house I was kept, gave me bread in the morning and the evening, but as for themselves they had only dates to eat. Islam has not permitted that the prisoners be kept in captivity forever so that the government may subject them to forced labor as long as it likes. If they are not exchanged for other prisoners of war, or ransomed, the method enjoined of doing them favor is that they should be made slaves and given in possession of individuals, and their masters instructed to treat them well. The third manner of doing favor with the prisoners according to the law of Islam is that they may be put under jizyah and made dhimmi subjects of the Islamic state and allowed to live as free citizens of dar-al-Islam (abode of Islam) just like the Muslims. The fourth favor is that the prisoner be set free without ransom. This is a special concession that the Islamic government can give only in case the special conditions of a prisoner demand it, or when it is expected that the concession will win the prisoner’s gratitude forever, and help turn him a friend from an enemy, or a believer from a disbeliever. According to Bukhari, Muslim and Musnad Ahmad, when Thumamah bin Uthal, the chief of Yamamah, was brought as a prisoner, the Prophet (peace be upon him) asked him: Thumamah, what do you say? He replied: If I am killed, then such a one would be killed, whose blood has some value: if I am shown favor, then favor would be shown to a person, who appreciates favor; and if you want wealth, ask for it, you will be given it. For three days the Prophet (peace be upon him) asked him the same thing and he gave the same reply. At last, the Prophet (peace be upon him) ordered that Thumamah be set free. On attaining freedom, he went to a nearby oasis, washed himself and came back, pronounced the kalimah and became a Muslim, saying: Before this day nobody was more detestable than you and no religion more odious than your religion in my sight, but now for me no man is more lovable than you and no religion more lovable than your religion. Then he went to Makkah for Umrah and gave the people of Quraish a notice to the effect: After this no grain will reach you from Yamamah unless Muhammad (peace be upon him) permits it. So, he stopped the grain supply and the people of Makkah had to request the Prophet (peace be upon him) that he should not stop the supply of grain for them from Yamamah. At the conquest of Makkah, the Prophet (peace be upon him) forgave all the people of Makkah except only a few men, and did not kill more than three or four of even those who had been made an exception. The whole of Arabia was well aware of what atrocities the people of Makkah had committed against the Prophet (peace be upon him) and the Muslims; yet he forgave them after attaining complete victory over them, gave the Arabs the satisfaction that they had not been overpowered by a tyrant but by a merciful, affectionate and generous leader. That is why after the conquest of Makkah the Arabian peninsula did not take longer than two years to be completely subdued. This explanation makes it abundantly clear that Islam has formulated a comprehensive code in respect of the prisoners of war, which contains provision for this problem in every age under all sorts of conditions. Those people who take this Quranic verse in its simple meaning that the prisoners of war should either be shown favor and set free or freed for ransom, do not know what different aspects the question of the prisoners of war has, and what problems it has been creating in different ages and can create in the future. 5. He will guide them and set their condition right 6. and will admit them to Paradise with which He has acquainted them. This is the profit that the martyrs falling in the way of Allah will gain. Its three grades have been stated: (1) That Allah will guide them, (2) That He will set their condition right, (3) That He will admit them into the Paradise with which He has acquainted them beforehand. Guidance here obviously implies guiding to Paradise; setting the condition right implies that before their entry into Paradise, Allah will adorn them with robes of honor and remove every filth which had polluted them in the life of the world; and the third stage means that even in this world they have been told through the Quran and the Prophet (peace be upon him) what kind of Paradise it is that has been prepared for them. When they enter that Paradise they will enter a place with which they will already be familiar and they will come to know that they have been blessed precisely with the same that had been promised to them in the world. 7. O you who believe! If you help (in the cause of) Allah, He will help you, and make your foothold firm. 8. But those who disbelieve (in the Oneness of Allah Islamic Monotheism), for them is destruction, and (Allah) will make their deeds vain. 9. That was because they were averse to what Allah had revealed; so He let their works go to waste. That is, they preferred the whims, superstitions, customs and moral perversion of their former ignorance and did not like the teaching that Allah had revealed to guide them to the right way. 10. Have they not journeyed through the land to see the end of those who went before them? Allah utterly destroyed them. These unbelievers are doomed to the same end. This sentence has two meanings: (1) The same destruction that was met by those disbelievers now awaits these disbelievers, who are not accepting the invitation of Muhammad (peace be upon him), (2) The ruin of those people does not end with the torment of the world; the same doom also awaits them in the Hereafter. After being wounded at Uhud when the Prophet (peace be upon him) was resting in a hill pass with a few companions, Abu Sufyan shouted: We have Uzza and there is no Uzza for you. Thereupon the Prophet (peace be upon him) told his companions to respond, saying: Our Protector and helper is Allah, and you have no protector and helper at all. This reply of the Prophet (peace be upon him) was derived from this very verse. That is, just as an animal eats and does not think where from the food it eats has come, who has created it, and what rights of the creator are imposed on it for providing it with food, so are these people also eating and have no higher values or ideals beyond eating. 13. And many a town, stronger than your town (Makkah) (O Muhammad ) which has driven you out We have destroyed. And there was none to help them. The Prophet (peace be upon him) was sorely distressed on leaving Makkah. When he was compelled to emigrate, he had stood facing the city outside it and said: O Makkah, you are the most beloved city in the sight of Allah, and I have the greatest love for you out of all the cities of Allah. If the polytheists had not driven me out, I would never have left you. About this it has been said: After driving you out of the city the people of Makkah think that they have achieved a great success, whereas, in fact, they have hastened only their own ruin by this evil act. The style of the verse clearly indicates that it must have been revealed soon after the Hijrah. 14. Then, can he, who is on a Clear Guidance from His Lord, be like him whose evil deeds have been embellished to him, and who pursued their lusts? That is, how is it possible that when the Prophet and his followers have been guided by Allah to a clear and straight path and they have started following it in the light of full knowledge and vision, they should walk along, with those who are still persisting in their ways of ignorance, who regard their deviation as guidance and their evildoing as a praiseworthy thing, and who judge on the basis of their personal desires, and not by argument as to what is the truth and what is falsehood. Now, neither can the lives of these two groups be alike in this world nor can their end be alike in the Hereafter. 15. Here is the parable of Paradise which the God-fearing have been promised: in it shall be rivers of incorruptible water, rivers of milk unchanging in taste,and rivers of wine, a delight to those that drink; and rivers of pure honey. In it they will have every kind of fruit as well as forgiveness from their Lord. Can such be like those who will abide in the Fire and will be given a boiling water to drink that will tear their bowels apart? The word 'aasin' is used which is the taste and color of water which has changed, or which gives a bad smell. In the world the water of rivers and canals is generally muddy; its taste and color change due to the mixture of sand and dust and of different kinds of vegetation in it, and it also gives off a kind of bad smell. Therefore, the quality of the water of the rivers and canals of Paradise will be such that it will be pure and clear, without any adulteration. In a Hadith attributed to the Prophet (peace be upon him), it has been explained thus: It will not be the milk squeezed from the milk glands of animals. That is, it will be the milk which Allah will bring out in the form of springs from the earth and cause it to flow into canals of Paradise. About this natural milk it has been said: Its flavor will not change at all; that is, it will not give even the slightest offensive smell that is found in every kind of milk squeezed from the animal milk glands. In another Hadith attributed to the Prophet (peace be upon him), it has been explained, thus: This wine will not have been distilled from rotten fruit by beating and fermenting, like the wine in the world, but Allah will produce it also in the form of springs and cause it to flow into canals; then its quality will be such that it will be delightful for the drinkers. That is, it will not be bitter and foul-smelling like the wines of the world, which cannot be drunk even by the most habitual drinker without showing some distaste. In Surah As-Saffat, another quality of it has been described: Neither will the drinker be harmed physically thereby nor become drunk. (verse 47). In Surah Al-Waqiah it has been said: Which will neither cause them giddiness nor affect their sense. (verse 19). This shows that wine will not intoxicate, but will only give pleasure and delight. In the Hadith it has been explained, thus: The honey will not have been drawn from the bees’ bellies, but it will also come out from springs and flow into canals; therefore, it will not have wax, and pieces of the honey-comb and legs of dead bees mixed in it, but it will be absolutely pure. The mention of forgiveness from Allah after the blessings of Paradise can have two meanings: (1) That the greatest blessing by far will be that Allah will forgive them. (2) That the errors and faults that they happened to commit in the world, will not even so much as be mentioned before them, but Allah will cover them up forever so that they are not put to shame in Paradise. 16. Among them some give ear to you. But no sooner do they leave your presence than they ask those endowed with knowledge: “What is it that he said just now?”25 Such are those whose hearts Allah has sealed and who pursue their lusts. This is concerning those disbelievers and hypocrites and unbelieving followers of the former Books, who sat in the assemblies of the Prophet (peace be upon him), listened to his discourses, or the verses of the Quran, but since in their hearts they were averse to the themes presented by him, they would understand nothing in spite of listening to him. Therefore, when they came out, they would ask the Muslims: What was he saying just now? In fact they were the slaves of their lusts, and the teachings that the Prophet (peace be upon him) was presenting fell against their lusts. Therefore, if ever they sat in the assemblies of the Prophet (peace be upon him) and listened to him, they would understand nothing. Those who accept guidance means that it is the same revelations about which the disbelievers and hypocrites ask: What was the Prophet (peace be upon him) saying just now? become a cause of further guidance for the rightly guided people, and from the same assembly from which these unfortunate people rise without gaining anything, the fortunate ones return with a new treasure of knowledge and insight. Thus Allah grants them the grace to develop in themselves the kind of piety taqwa that they have the capability to develop. The portents of Resurrection imply those signs which indicate that its approach is near. One such important sign is the advent of God’s last Prophet after whom no other prophet will come till Resurrection. Traditions have been related in Bukhari, Muslim. Tirmidhi and Musnad Ahmad on the authority of Anas, Sahl bin Saad As-Saidi and Buraidah, saying that the Prophet (peace be upon him) raised his index finger and the middle finger and said: My advent and Resurrection are like these two fingers. That is, Just as there is no other finger between these two fingers, so no other prophet will be raised between me and Resurrection; after me only Resurrection now will occur. 19. So know (O Muhammad ) that La ilaha ill-Allah (none has the right to be worshiped but Allah), and ask forgiveness for your sin, and also for (the sin of) believing men and believing women. And Allah knows well your moving about, and your place of rest (in your homes). However hard and sincerely may man be trying to serve and worship his Lord and fighting and struggling in the cause of His Religion, he should never be involved in the misunderstanding that he has done and accomplished whatever he was required to do. Rather, on the contrary, he should have the feeling that he has not been able to do full justice to what was expected of him by his Lord and Master. Therefore, he should confess his errors constantly and pray to Allah saying Lord, forgive me for whatever fault and error I may have committed in Your service. This is indeed the essence of Allah’s command: O Prophet, ask forgiveness for your fault. This does not mean that God forbid, the Prophet (peace be upon him) had actually committed an error willfully, but its correct meaning is that it did not even behoove the servant who was the greatest worshiper of his Lord that he should harbor even a tinge of the pride of accomplishment in his heart, but his true position also was that in spite of all his great and glorious services he should continue confessing his shortcomings before his Lord. It was under this state of the mind that the Prophet (peace be upon him) often implored his Lord for forgiveness. According to Abu Daud and Nasai, the Prophet (peace be upon him) is reported to have said: I implore Allah for forgiveness one hundred rimes every day. Ayahs 20-38 are about the faint-hearted who are condemned and it has been cautioned that those who strive and turn away will be taken to task. 20. The believers used to say: “Why is a surah (that would ordain fighting) not revealed?” But when a definitive surah was revealed wherein fighting was mentioned, you saw that those in whose hearts there was a sickness looked at you as though they were about to faint at the approach of death.Pity on them! 21. Obedience (to Allah) and good words (were better for them). And when the matter (preparation for Jihad) is resolved on, then if they had been true to Allah, it would have been better for them. 22. Would you then, if you were given the authority, do mischief in the land, and sever your ties of kinship? Verse 22: This verse clearly points out that Islam forbids severing of relations with the kindred. The word rahm in Arabic is used for kinship and relationship by blood metaphorically. All the relations of a person, whether near or distant, are his kinsmen. The nearer the relationship the greater the right one has upon the other and greater the sin of severing the ties of blood. To treat the kindred well implies that one should do his utmost in doing whatever good he possibly can to his relative. As well as, he should avoid doing any ill or harm to him. Reasoning from this very verse Umar had forbidden as unlawful selling of the slave girl who had given birth to a child from her master, and the companions had concurred with him in this. Hakim in his Musradrik has related on the authority of Buraidah that one day when he was sitting among the audience of Umar, suddenly a clamor arose in the street. On inquiring it was known that a slave girl was being sold and her daughter was crying. Umar immediately got the Ansar and the Muhajirin together and put before them the question: Do you find in the religion that Muhammad (peace be upon him) has brought any room for severing of relations between the blood relationships? Everybody replied in the negative. Thereupon, Umar said: Then, how is it that in your houses a mother is being separated from her daughter? Could there be a greater and more serious instance of the cutting of these relationships? Then he recited this verse. The people said: You may adopt whatever measure you deem fit to stop this practice. At this Umar issued this decree for enforcement in all the Islamic territories: No slave-girl who has given birth to a child from her master is to be sold because this is breaking of kinship ties which is not lawful. 23. Such are they whom Allah has cursed, so that He has made them deaf and blinded their sight. 24. Do they not then think deeply in the Qur’an, or are their hearts locked up (from understanding it)? That is, either these people do not ponder over the Quran at all, or if they try to ponder over it, its teachings and meaning do not enter into their hearts, because they have put locks on them. As for this; “are there locks upon their hearts” means: There are such locks for them as are specially meant for the hearts which are not susceptible to the truth. 25. Verily, those who have turned back (have apostated) as disbelievers after the guidance has been manifested to them, Shaitan (Satan) has beautified for them (their false hopes), and (Allah) prolonged their term (age). 26. This is because they said to those who hate what Allah has sent down: “We will obey you in part of the matter,” but Allah knows their secrets. Vers 26: That is, in spite of professing the faith and being counted among the Muslims, they went on conspiring secretly with the enemies of Islam and even pledged to support them in certain matters. That is, in the world they adopted this attitude so that they may safeguard their interests and may protect themselves from the dangers of the conflict between Islam and infidelity, but how will they escape Allah’s wrath after death? At that time, no device of theirs will prove helpful for them to remain safe from the punishment by the angels. This verse also is one of those verses that point to the torment of barzakh (i.e. torment of the grave). It clearly shows that the unbelievers and hypocrites start being afflicted with the torment right from the time of death, and this torment is different from the punishment which they will get on Resurrection after their cases will have been decided by Allah. (For further explanation, see( Surah An- Nisa, Ayat 97); (Surah Al-Anaam, Ayats 93-94); (Surah Al- Anfal, Ayat 50); (Surah An-Nahl, Ayats 28, 32); (Surah Al- Muminun, Ayats 99-100); (Surah YaSeen, Ayats 26-27); (Surah Al-Mumin, Ayat 46). This refers to all those works that they performed as Muslims. Their Prayers, their Fasting, their payments of the Zakat, and all other acts of worship and virtue, which in appearance and form are counted among good works, were rendered void, for they failed to adopt the attitude of sincerity and loyalty towards Allah and Islam and the Muslim community, even though they professed to be Muslims. But, on the contrary, they went on conspiring with the enemies of Islam for the sake of small worldly gains, and started devising schemes to save themselves from any possible risks as soon as time came for Jihad in the cause of Allah. These verses are absolutely decisive and conclusive in this regard that in the conflict between Islam and un-Islam the faith of the person whose sympathies are not with Islam and the Muslims, or are with disbelief and the disbelievers, cannot at all be reliable, not to speak of any of his works being acceptable before Allah. Verse 32: This verse has two meanings: (1) That Allah will render vain and fruitless all those works which they had performed as good works, and they will get no reward whatever for them in the Hereafter. (2) That all the devices that they are adopting to obstruct the way of Allah and His Messenger’s (peace be upon him) religion will prove ineffective and fruitless. 33. O you who believe! Obey Allah, and obey the Messenger (Muhammad ) and render not vain your deeds. In other words, the deeds being beneficial and yielding of good results depends wholly on one’s obedience to Allah and His Messenger. After one has turned away from obedience, no deed remains a good deed so that one may deserve any reward for it. 34. Verily, those who disbelieve, and hinder (men) from the Path of Allah (i.e. Islam); then die while they are disbelievers, Allah will not forgive them. 35. So, be not faint-hearted and do not cry for peace. You shall prevail. Allah is with you and will not bring your works to nought. When this discourse was revealed only a handful of the Muslims consisting of a couple of hundreds of the Muhajirin and Ansar living in the small town of Madinah were upholding the standard of Islam and they were not only faced by the powerful Quraish but also by the whole of pagan Arabia. Such were the conditions when they were exhorted not to show weakness and not to beg (the enemy) for peace, but to make preparations for the decisive conflict. This does not mean that the Muslims should never negotiate for peace, but it means that in a state like this it is not right to initiate peace negotiations when it shows the Muslims’ weakness, for it will still further embolden the enemy. The Muslims should first establish their superiority in power and strength; then if they negotiate peace there will be no harm. That is, as against the Hereafter, this world is no more than a means of temporary entertainment. The success or failure here is not anything real and enduring, which might in any way be important. The real life is the life Hereafter, and its success should be man’s main concern. Allah is Self-Sufficient: He does not need taking anything from you for His own self. If He tells you to spend something in His way, He does so not for Himself but only for your own good. Complete self-sacrifice, if voluntarily offered, has a meaning: it means that the persons's devotion is exclusively and completely for the Cause. But no law or rule can demand it. And a mere offer to kill yourself has no meaning. You should be ready to take risks to your life in fighting for the Cause, but you should aim at life, not death If you live, you should be ready to place your substance and your acquisitions at the disposal of the Cause. But it is not reasonable to pauperize yourself and become a hanger-on for the Cause. Moreover, the inborn tendency to self-preservation in an average man should lead to concealment and niggardliness if all were asked for the Cause, by Law, aid there would further be a feeling of bitterness and rebellion. 38. Behold! You are those who are called to spend in the Cause of Allah, yet among you are some who are niggardly. And whoever is niggardly, it is only at the expense of his own self. But Allah is Rich (Free of all wants), and you (mankind) are poor. And if you turn away (from Islam and the obedience of Allah), He will exchange you for some other people, and they will not be your likes. The verse 38 end with a very powerful warning by Allah for those who have not accepted Islam with their true hearts and are always looking over the shoulder of their links to their previous faith or conspiring with the powerful to do harm to the cause of Islam. Here the case of the special devotee and of the average man with his human foibles are distinguished. Stinginess is not a virtue: it hurts more the finer-nature of the individual practicing it that it hurts the Cause. Allah is free of all wants and independent of any want that we can meet. His Cause is similarly independent of human aid. But it uses human agency for our own human advancement. The need to be able to serve Allah's cause is ours. We are needy who should claim the privilege before the Lord of Bounties unbounded. If we desert the Cause, the Cause will not fail. Better men than we will uphold the flag. But should we fall, others will take our place, who are not so timid, half-hearted, or stingy. In Wordsworth's words, "High Heaven rejects the lore of nicely calculated less or more."